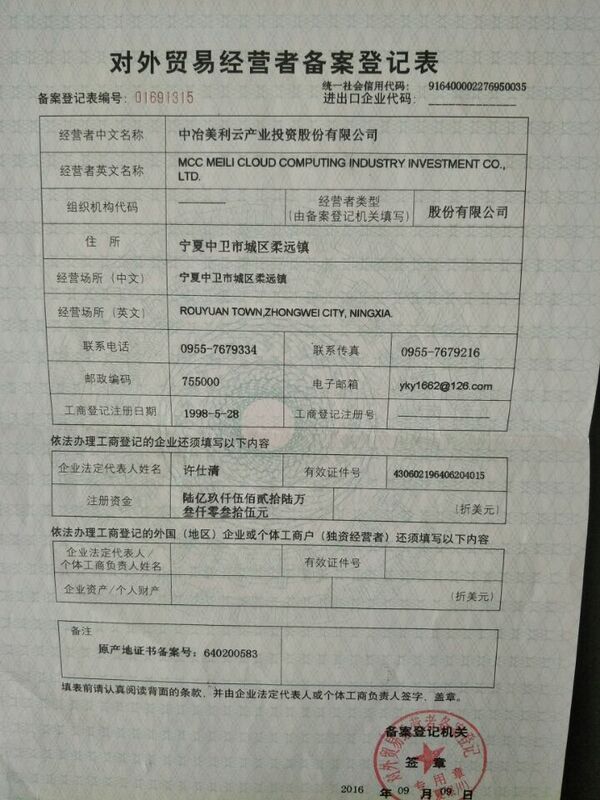 MCC Meili Cloud Computing Industry Investment Co., Ltd (hereinafter referred to as Meili Cloud) is a large state-owned enterprises which is affiliated with China Chengtong Holdings Group Ltd. Meili Cloud, listed on Shenzhen stock exchange in 1998, is the only listed companies in paper industry with registered capital ¥ 695 million and total assets ¥2.7 billion in Northwest China currently. It is also the largest specialty paper production base of the country with production capacity 250 thousand tons. Meili Cloud has its own paper forest base about 20 thousand hectares, and there are more than 1100 employees here now. 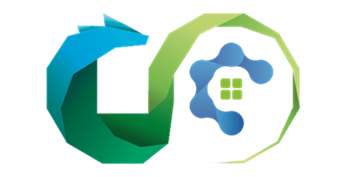 The company has realized transformation and upgrading in double main business operation mode of papermaking and cloud computing through the non-public stock into the cloud computing industry since the beginning of 2016. Meili Cloud located in Zhongwei Ningxia is adjacent to the Yellow River, and stands firmly in the Northwest China market thanks to the convenient logistics of Baotou-Lanzhou Railway, Baoji-Zhongwei Railway, No.109 state highway, No.201 provincial highway etc. and abundant resources such as coal etc. The products and services of the company have spread in the Northwest China, North China, South China, Southwest China and the other regions, and will own its broad market prospects and development space. The company is striving to improve its ability of independent research and innovation, at the same time it insists on putting the quality management of the product first and creating the high-quality products to the market. 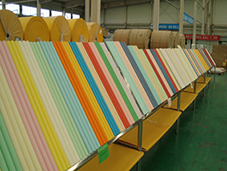 There are 9 varieties about more than 70 color systems of specialty paper products mainly including Color Offset Paper, Color Copy Paper, Color Card , Fluorescence Business Paste, Business Paste, Pearl Embossed Paper, Bubble Paper etc. Meili Cloud has the largest production capacity and varieties, the most complete for libraries, most timely delivery, and best service, meanwhile it also can develop new specialty paper products to meet the requirements of the customer .There are culture paper products of "Meili Cloud" brand such as Full Wood Pulp High-Grade Double Adhesive Paper, Full Wood Pulp High-Grade Copy Paper and Matt Double Adhesive Paper; also mid-range products of [Qinsizhu" brand like brand Double Adhesive Paper, Offset Printing Paper, Electrostatic Copy Paper, Myopia Prevention Paper etc. 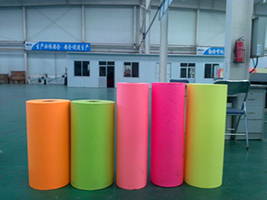 Production and sales of specialty paper are ranking first place of Color Paper industry in China at present, at the same time culture paper products such as Matt Double Adhesive Paper, Anti-adhesive Lining Paper, Electrostatic Copy Paper, Environmental Offset Printing Paper etc. are awarded as [Clean Product" of Ningxia Hui Autonomous Region. All the time the company insists that economic benefit, social benefit and ecological benefit should develop synchronously, and pays attention to environmental protection while improving the economic benefit. According to the national environmental policy and in combination with the practical situation of production, the thermal power plants have been equipped with 4x75t/h Sub-high Pressure Warm CFB Boiler and 3x12MW Steam Turbine Generator Unit. A boiler FGDD (Flue Gas Desulfurization and Denitration) system and an Overall Wastewater Disposal System with daily processing capacity of 50000 cubic meters have been supporting constructed to ensure that the emission of Sulfur Dioxide, Nitrogen Oxides, soot and wastewater toreach the standard. Meili Cloud obtained ISO9001 International Quality Management System Certificate since early 1999, passed the ISO14001 Environmental Management System Certification on February 7, 2006, the FSC /COC Forest Management System for Chain of Custody Certification on June22, 2009, and Voluntary Cleaner Production Audit in November2009. The company has been repeatedly honored with the title of [Advanced Enterprise of Environmental Protection", the title of [Advanced enterprise of pollution control", the title of [Advanced Unit of Energy Conservation and Emissions Reduction in2008, 2009, and2010"by the government. Besides, the company was awarded [Leading Enterprise of Energy Conservation and Emissions Reduction", [National Standardization of Agricultural Demonstration Base", [Contributive Enterprises of Ecological Environment Construction" by the Chinese Environment Federation and China business newspaper. In 2011, MCC was rated [Environment-friendly Enterprises in the Pulp and Paper industry of China" by China Technical Association of Paper Industry, and was certified by the Environmental Protection Department in September 2015. 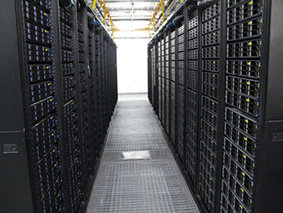 Now under the background of fully implementing the reform of state-owned enterprises, Meili Cloud will show the world new status of double main business operation mode of papermaking and cloud computing. The company is concentrating on scientific research and quality management with adhering to the principle "Customer First" to provide more high quality products and services, meanwhile serve the market to achieve a win-win situation.